In today’s world of fast changing markets, complex supply chain relationships and multi-channel distribution, firms are no longer able to operate under the constraints imposed by legacy ERP systems. As businesses change their processes from time to time, it is essential that their ERP solutions remain aligned. The alternative is fragmented islands of departmental solutions based on a combination of SaaS, server and Excel based applications that then feed your ERP for centralized accounting. In this eBook, we suggest 5 important questions a company should consider before moving forward with its next enterprise application project. Your answers to these questions may reveal you are already experiencing the limitations of legacy ERP and the impact to its business agility. These solutions typically take years to deploy, are late, over budget and often rejected by users. A flexible ERP solution allows the company to mold the solution to its business needs, not the other way around. A flexible ERP solution allows the business to grow, change and evolve while allowing its IT systems to keep pace and often enable positive organizational change where it is necessary to support its long term growth and business agility. 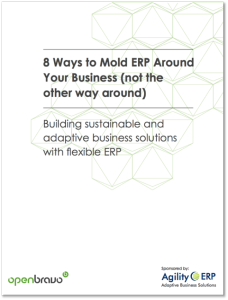 In this eBook, we also describe 8 ways that a flexible ERP approach will help you build sustainable and adaptive business solutions.